We are entering a new era. I call it "the Singularity." It's a merger between human intelligence and machine intelligence is going to create something bigger than itself. It's the cutting edge of evolution on our planet. One can make a strong case that it's actually the cutting edge of the evolution of intelligence in general, because there's no indication that it's occurred anywhere else. To me that is what human civilization is all about. It is part of our destiny and part of the destiny of evolution to continue to progress ever faster, and to grow the power of intelligence exponentially.To contemplate stopping that  to think human beings are fine the way they are  is a misplaced fond remembrance of what human beings used to be. What human beings are is a species that has undergone a cultural and technological evolution, and it's the nature of evolution that it accelerates, and that its powers grow exponentially, and that's what we're talking about. The next stage of this will be to amplify our own intellectual powers with the results of our technology. I once spent a few days with the late dolphinologist John C. Lilly, M.D. Talking about advanced intelligence in other species. I asked him, "How can you say that dolphins are more intelligent than we are? Isnt knowledge tautological? How can we know more than we do know? Who would know it, except us?" Ray Kurzweil posits that we will soon be facing a similar question through the merger of human and machine intelligence. "One response is not to want to be enhanced," he says, "not to have nanobots. A lot of people say that they just want to stay a biological person. But what will the Singularity look like to people who want to remain biological? The answer is that they really won't notice it, except for the fact that machine intelligence will appear to biological humanity to be their transcendent servants....there's a lot that, in fact, biological humanity won't actually notice." Kurzweil, an inventor and entrepreneur, has been pushing the technological envelope for years in his field of pattern recognition. Among his many accomplishments, he developed the technology behind the flatbed scanner, and he is a leading expert in speech recognition. In his radical view of the future the operant word is....exponential. For example, "One application of sending billions of nanobots into the brain is full-immersion virtual reality. If you want to be in real reality, the nanobots sit there and do nothing, but if you want to go into virtual reality, the nanobots shut down the signals coming from my real senses, replace them with the signals I would be receiving if I were in the virtual environment, and then my brain feels as if it's in the virtual environment. And you can go there yourself  or, more interestingly you can go there with other people  and you can have everything from sexual and sensual encounters to business negotiations, in full-immersion virtual reality environments that incorporate all of the senses." RAY KURZWEIL was the principal developer of the first omni-font optical character recognition, the first print-to-speech reading machine for the blind, the first CCD flat-bed scanner, the first text-to-speech synthesizer, the first music synthesizer capable of recreating the grand piano and other orchestral instruments, and the first commercially marketed large vocabulary speech recognition. He has successfully founded, developed, and sold four AI businesses in OCR, music synthesis, speech recognition, and reading technology. All of these technologies continue today as market leaders. 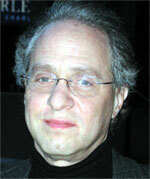 Kurzweil received the $500,000 Lemelson-MIT Prize, the world's largest award in invention and innovation. He also received the 1999 National Medal of Technology, the nation's highest honor in technology, from President Clinton in a White House ceremony. He has also received scores of other national and international awards, including the 1994 Dickson Prize (Carnegie Mellon University's top science prize), Engineer of the Year from Design News, Inventor of the Year from MIT, and the Grace Murray Hopper Award from the Association for Computing Machinery. He has received ten honorary Doctorates and honors from three U.S. presidents. He has received seven national and international film awards. He is the author of The Age of Intelligent Machines, and The Age of Spiritual Machines, When Computers Exceed Human Intelligence.